Obama had a good month in December's polling, and everything points to his numbers improving even more dramatically in January. Ever since the midterm election, Obama has been making bold political moves, and it seems they are starting to pay off in rising public support. But before we look at the larger trends, let's take a look at this month's numbers first. A lot happened in the political world in December, but much of it had nothing to do with Obama, at least in the public's eyes. A lame-duck Congress passed the "cromnibus" bill which will avoid government shutdowns for a full year (except for Homeland Security, which will be battled over in February). Obama pushed to get it through, earning the scorn of some Democrats, but most of the public didn't even notice the bill's passage. Dianne Feinstein released her long-awaited torture report, but it was seen as very old news (it might affect George W. Bush's approval ratings more than Obama's, to put this another way). George's brother Jeb is getting ready to run for the 2016 Republican nomination, but again this didn't affect Obama in the least. There were three big stories that did directly affect Obama, though. Obama began the month with some extremely good economic news, when the monthly unemployment report was released. He then surprised all of Washington (and the rest of the country as well) by announcing the end of a half-century-long failed policy towards Cuba, which the public is overwhelmingly in favor of doing. Obama also dealt with the Sony hack pretty decisively (rightly or wrongly, this is how the public perception went) by taking down North Korea's web access within days. Now, the facts aren't all known about either the Sony hack or the response, and may never fully be. Nevertheless, Obama seems to have gotten a certain amount of "rally 'round the president" effect in the polling at the end of the month. Perhaps it was just seasonal goodwill, though. In December Obama's average monthly job approval rose 0.4 percent, to reach 42.4 percent. His average monthly job disapproval fell even more, down 0.6 percent to 52.8 percent. These are the best numbers Obama has posted since May, for context. Obama did well throughout the month, as some of his bold actions are now gaining him back supporters who may have abandoned the president earlier in the year. He started the month in good position and had an early good spike in his daily polling averages (his approval reached 43.3 the first week in December, the highest it would hit all month). But then when his numbers dipped the next week, even the lowest daily numbers he charted (41.8 approval, 53.4 disapproval) were still better than November's averages. By the end of the month, he was back to the high end of the range again, which bodes well for January. 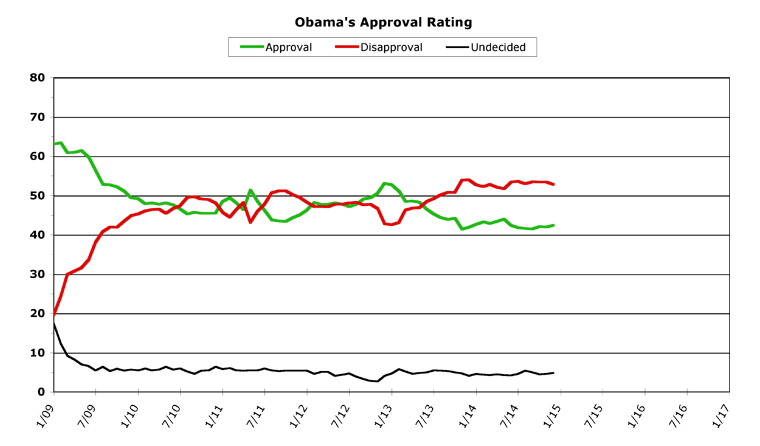 The overall trends for Obama's polling are excellent, for the most part. He is poised to chart a big spike upwards in his averages in January, perhaps beating his numbers for all of 2014. Before we look forward to this new trend, however, let's take a quick look back at 2014 -- the flattest year Obama has ever charted. We've mentioned this previously, but for all the talk of "Obama's poll numbers are tanking" over the course of the past year, they actually stayed remarkably stable. His numbers started out pretty bad, but they didn't improve or deteriorate much at all for the entire year. So "Obama's poll numbers are still pretty bad" was correct, but "Obama's poll numbers are tanking" simply was not. As you can see, Obama went through a lazy sine wave all year long, first up a bit then down a bit and slowly coming back up. In fact, he ended the year almost exactly where he began it -- last January's monthly averages were 42.7 approval and 52.7 disapproval. 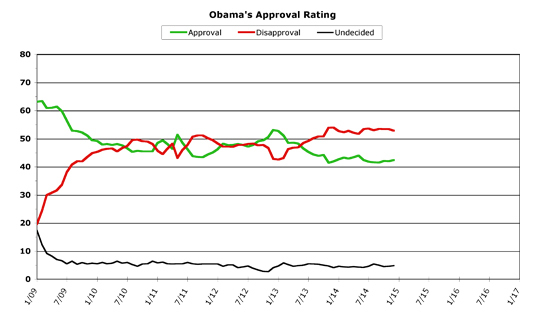 Obama closed out December with 42.4 percent and 52.8 percent, respectively. That is unbelievably close, for an entire year chock full of politics. In the past year, Obama hit his high points in May, when he managed 44.0 percent approval and 51.7 percent disapproval. He managed to not hit an all-time worst monthly showing in both categories all year long, although only by the skin of his teeth. Over the course of the year, Obama's monthly approval rating improved in six of the months and fell back in the other six -- about as even as you can get. He did slightly better in disapproval, improving in seven months, losing ground in only four, and not moving at all during one month. Overall, it was about as stable a year as can be imagined in public polling. OK, enough context, let's look forward instead. Now, I'm not going to cast aspersions on RealClearPolitics, where we get our data for the daily averages for these charts. After all, the last week of the year is pretty hectic for everyone, and so they might have just not had much opportunity recently to update their own data set. But instead of only going back roughly two weeks (as they normally do), as of this writing they've still got polls listed from early December in their rolling average. The reason this is significant is because Obama has dramatically improved in the past two weeks or so. Which is why the trendline for January is looking so good right now. Take the individual polling numbers posted since the middle of the month -- approval (48, 37, 41, 48, 49) and disapproval (50, 54, 56, 48, 49). These average out to 44.6 percent approval and 51.4 percent disapproval. But because the older data is still being added in, Obama's daily averages are officially only 43.2 percent and 52.3 percent, respectively. That's a significant difference. If Obama held this average all month long, he'd wind up gaining 2.2 percent on approval and 1.4 percent on disapproval. This would be the best month Obama would have since December of 2012, right after he got re-elected (his "second honeymoon" period). Of course, that's all hypothetical for the moment. But what isn't hypothetical is the rise in Obama's polling in the past few weeks. As I stated, he's almost always had a good run in the wintertime. Of the six Decembers he's been in office, he has only ever lost ground in one of them (2009, during the slide downwards from his first honeymoon period). 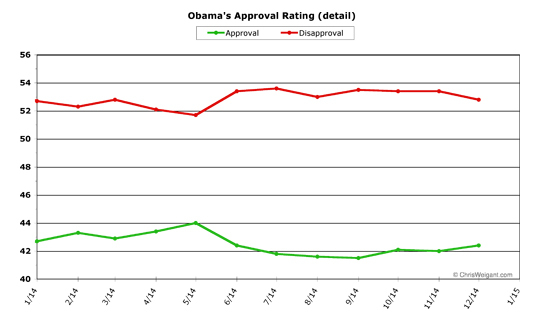 And usually when Obama improves in December, he rides a wave of improvement through at least January and February. This could play out again in 2015. In general, Januaries are favorable to just about any president (barring unforeseen crises, of course), because they get to end the month with the biggest presidential speech of the year -- the State Of The Union. The new Congress will get sworn in, but they likely won't accomplish much before the night of the big speech (the contentious political battles will be fought in February and beyond, for the most part). The media is finally reporting on the improving economy, and next week the new unemployment numbers will be out. If they are as good as last month's (or better), it will likely be reflected in the growing consumer confidence and may help boost Obama's job performance approval with the public even more. Obama seems on track to post big gains in January, perhaps even bettering all his monthly scores for the entire past year. His numbers are still low in the absolute sense (no president wants to be below 45 percent approval, to state the obvious), but they sure seem poised to get a lot better very soon. The American people understand very well what this president has had to deal with - domestically and internationally - and, while they would have liked to have seen a better effort and results, on both fronts, they still feel that Obama deserves, at the very least, the benefit of any doubt. This leaves a window of opportunity for the Republicans. But, if they fail to take full advantage of it, then they may pay the price for many years to come and Obama's final numbers may be far better than anything that Michale and his brethren could ever have dared to imagine. I know I'm beating a horse that has already passed away, but of your two graphics, the second one is so much the better approach. We really do not need the vertical axis to be wide enough to include the undecideds. The variation in month-by-month numbers for this demographic is noise (sampling variability). Even if it is not, it is not in any way instructive. The second graphic, omitting this group, is much more clear. That's my soap box. I won't even touch the "lazy sine wave" comment. Earlier comment: Oregon doesn't have a sales tax. Washington doesn't have an income tax. Prior to the recession, Oregonians could go to WA, show their OR ID and were exempt from sales taxes, but WA residents still pay them. I believe this changed after the recession. I think I now pay sales tax in WA. I completely and whole-heartedly agree with you Liz..
An electronics technician, per chance?? Worse, Michale. I teach math for a living. I also posted a second comment for you last night, replying to an earlier query, but it seems to be swirling around in the spam filter or something. Or would ya'all be totally gabberflasted that Bush would so totally and so unequivocally ignore the will of the people in pursuit of a partisan agenda that, in ya'alls opinion, was completely against the best interests of the country.. I think it's a fair question, all things being equal.. Watching poll numbers so closely for so long now, I think you are largely right. But the polling can change for reasons beyond the president's control (Crimea, or gas prices) in significant ways. The interesting thing about the GOP is that the stars have now aligned such that the GOP and Obama both want to get things done for the next two years. Obama, because of his legacy. The GOP, to set the field for 2016 ("See? We CAN govern if given the chance!"). Because of this unusual alignment, maybe things will happen. Maybe not. The public generally doesn't pay that close attention. If Washington is being disfunctional, then everyone's poll numbers drop. If budgets are passed on time (no matter what's in them), everyone gets a boost. So there's that to keep an eye on as well. I will check my PO Box for the cheque. Heh. So to speak. Yeah, I often run the "detail" graph to show the movement better, but not every month. However, I think next month there will be dramatic movement that will show up even on the large-scale graph. I chose the larger scale not so much to keep the undecideds on there but for comparison purposes with other presidents (see the left-hand side of "obamapollwatch.com" for these comparisons). The Bushes (both of them), Clinton, Nixon, and Eisenhower all pushed the graphs to the extremes. I did cut it off at 80% (removing both Bushes' post-war spike peaks), but I had to go for a graph which showed most of every president's ratings. Obama has been unusual in his stability, which is partly due to the data. For Obama, I use the "poll of polls of polls" monthly average, which does tend to smooth things out, but for previous presidents I used only Gallup monthly polls, which jump around quite a bit more. In any case, you aren't the first to make this complaint, which is why I run the detail chart so often. But for the big picture stuff, I have to keep with the metric I first developed for comparison purposes (so that all the comparison charts don't have different scales). Sorry about the spam filter, your comment has been reborn. (cough, cough)... "signing statements"... (cough, cough). Democrats did whine, but they were a lot less whiny than the GOP, I'll give you that. In the spirit of being fair and objective. Heh. And I would also dispute that "signing statements" and "executive orders" have similar impact on the lives of innocent Americans..
And NOW we have "Presidential Memorandum" to contend with as well..
Why can't politicians just stick with plain english?? Let me ask the question in a different way..
Do ya'all think that what the American people said to Bush and the Republicans with The Great Thumpin' Of 2006 is the same thing the American people said to Obama and the Democrats with The Great Nuclear Shellacking Of 2014??? I don't really see 2006 and 2014 the same. Objectively, 2006 was really about a single issue: war. The American people were tired of it. Bush booted Rumsfeld because of the election. 2014 was more about general dissatisfaction. It was certainly anti-Obama, but it was less focused than the 2006 election. Maybe that's splitting hairs, I'm not saying this in defense of Obama at all (like I said, I think it was an anti-Obama election), but I think it was kind of different. I think 2010 was a lot more similar to 2006, just because it was focused on a single issue. New banner is up. You may have to reload the page to see it. Thanks to everyone for a successful 2014 pledge drive! Woo hoo -- we made our goal, and can keep the lights on for another year without resorting to ads! I don't really see 2006 and 2014 the same. Objectively, 2006 was really about a single issue: war.